For Indonesians, banana blossoms are no delicacy. It's plentiful, very affordable, and available almost all year round. Growing up, this dish appeared so many times on our family dinner table and always a crowd pleaser. 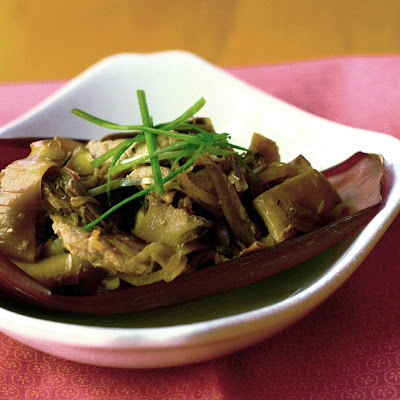 Lucky for me, banana blossoms are also available in my local Asian stores here in Bay Area, so I can re-create this dish any time I feel inspired. Peel the outer layers of the banana blossom, getting rid as much as possible of the dark purple layers. Cut the banana blossom in half, lengthwise, from the tip to the bottom. Lay one half, flat side down on the cutting board, and cut crosswise into 1/2 inch strips. Repeat with the other half. Put them in a colander and rinse well under running water. In a large saucepan, boil banana blossoms in water until they turn soft, about 30-45 minutes. Remove from heat and drain. Using mortar and pestle, grind shallots, garlics, chili peppers and ginger until it forms paste. Heat the oil in a wok or skillet over medium heat, add spice paste into the oil and cook until fragrant. Add pork, lemongrass, shrimp paste and sugar into the skillet, cook until the pork is done and no longer pink. Add banana blossoms and chicken stock into the pork mixture, stir and blend together. Season with salt and pepper. Cook for another 5 minutes and remove from heat. Serve with steamed rice, garnish with green onions. We do amazing curry dishes with banana blossoms in India. But this?I have never eaten banana blossoms with pork and lemongrass! I must say this recipe is simply AWESOME! I must say this is the first time I ever seen this food and I am an Indonesian! What an embarrassment! Which ethnic group/province is it from?